A black and white photograph of 201 Brock Street North in winter. View is of the side of the house taken from Mary Street. The Free Church at the north-east corner of Brock and Mary Streets, was built circa 1849 and owned by Peter Perry. It was used as a church by the Methodists and the Presbyterians until their churches were built in the late 1850s. This building was one of the first meeting places of the Provisional Council of the County of Ontario in 1852, and the Mechanics' Institute was founded here in 1852. By 1860 it was converted into a house and remained so until it was demolished in September 1968. 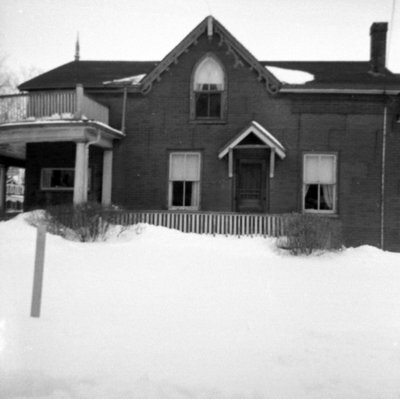 201 Brock Street North, February 1962, Brian Winter. Whitby Archives A2013_004_230.